One of my big missions with Not A Ballerina is to convince everybody in the world that travel is good for them and good for the world. It all fits with my somewhat idealistic theory that if everybody was able to travel a fair bit, meet lots of different people and see lots of different cultures, then a whole lot of problems we have in the world would disappear – you know, bye-bye racism, wars, religious hate, etcetera etcetera. I guess it’s not entirely likely that I will change the whole world but even if I can get a few readers to start thinking more broadly, to travel more widely, to be more open and accepting of difference, and so on, then I would feel that all this work is extremely worthwhile. Which leads me to this: the big Why Travel list. There are so, so many reasons why I think travel is beneficial, so many that I’m going to be blogging about them for years to come, I think. This list will start off being inspired by a bunch of other bloggers who’ve talked about reasons why they travel (list of inspiration sources is at the bottom) along with my own reasons to travel, and as time goes on I’ll be taking one of those reasons and looking into it in more detail, based on my own experiences and those of my readers. But the list isn’t set in stone – it will grow. 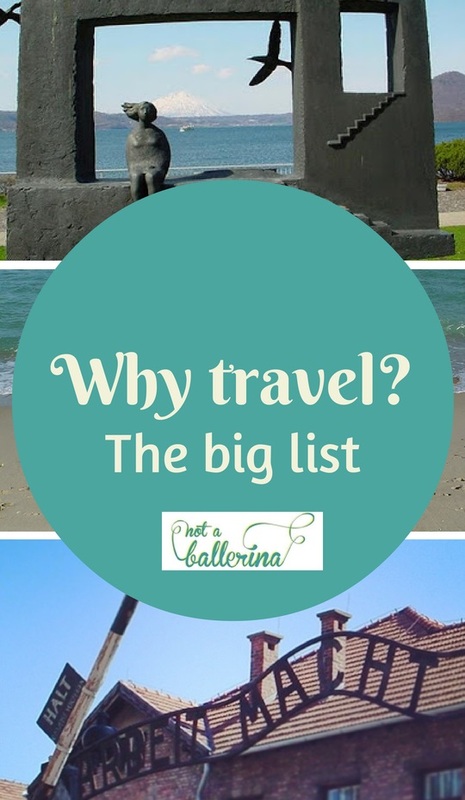 And if you have any more reasons for my “Why Travel” list then email me or ask me over on the Not A Ballerina Facebook page. Thanks!